In Podcast 104, we discussed how to avoid killing hemodynamically unstable patients while intubating. Today's podcast takes that concept a step further to allow you achieve a hemodynamically neutral intubation. Higher Vt/Lower Rate as per Davis et al. Scott Weingart. 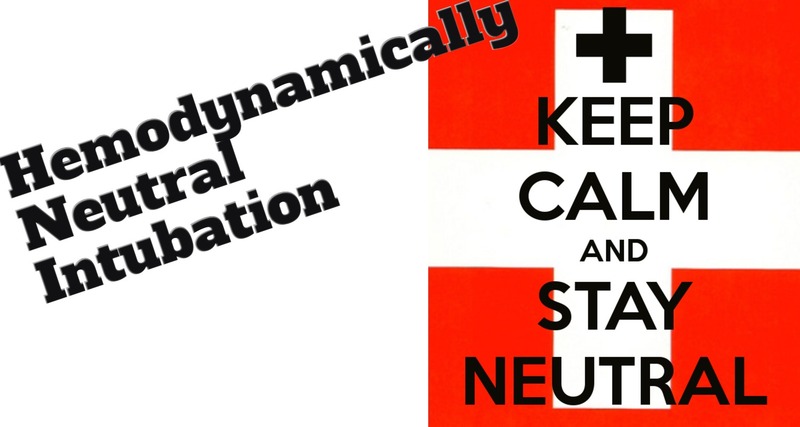 EMCrit RACC Podcast 216 – The Hemodynamically Neutral Intubation. EMCrit Blog. Published on January 22, 2018. Accessed on April 22nd 2019. Available at [https://emcrit.org/emcrit/hemodynamically-neutral-intubation/ ]. This Post was by the EMCrit Crew, published 1 year ago. We never spam; we hate spammers! Spammers probably work for the Joint Commission. Dr. Weingart, can you explain how CPAP and PS at Zero does anything? Does the ventilator provide any support? With the PEEP & PS at 0, the vent would do exactly nothing, which is actually one of the big points in (an expert level player) using the approach described. As he explained in the beginning the 3 causes of peri-intubation hypotension are: vasodilatory effects of sedatives, loss of sympathetic drive with sedatives, and conversion to positive pressure ventilation, and this approach is designed to avoid them all to the degree possible. Any degree to which the ventilator supports the pt is positive pressure ventilation (whether a little w/ something like PEEP 0, PS 5 or a lot w/ something like PEEP 10, PS 10), and will cause a loss of venous return/decrease in BP. Sounds really strange to have a ventilator doing nothing (except preventing apnea since a backup rate should kick in if the pt went apneic) w/ an intubated pt, but I’d speculate that it’s this doing very weird things for very good reasons that adds the “expert level players only” in addition to the “bleeding edge” which is there since this is not evidence based (and probably never will be…can’t exactly do an RCT w/ pts in extremis). I understand WHY, I’m wondering what if anything the vent does. With Zero pressure support and PEEP, what does the ventilator do, if anything? Does it just open the valves to allow the flow of gas? Gotcha. Yeah, it should just open the circuit (I’m sure there would be specifics for each particular vent that reps/RT’s might know). You could, of course, still control FiO2, and it would calculate VTe, minute ventilation, etc as normal with alarms/back up rates in the case of hypoventilation or apnea depending on the ventilator’s backup settings and your alarm settings. I’m sure it would still have all the same indicators of pt effort, too (familiar w/ LTV1200 which has a pt effort light, I know some hospital vents show that with different colors of waveform). I’m not an expert at vents or anything, but hopefully that does better to answer your question. I am not so sure this is correct. Setting a pressure support of 0 implies that a pressure of zero will be maintained in the airway circuit. Spontaneous breathing is performed by generating a negative pressure, not a zero pressure. That makes me think that a PS of 0 would actually be offering just enough pressure to “counter” the negative inspiratory force. It’s less impactful than having a positive pressure >0, but more than being open to air with something like T-piece. that is not how Press Support Works. Well the main way is regarding a setting of zero on PS. If you set it to zero, the system doesn’t attempt to maintain a Paw of zero, it actually deactivates PSV. A vent set to PSV 0 and CPAP 5 becomes a pure CPAP mode–there is no alteration of what happens during the insp. phase through PSV. As to the rest of your description of PSV, yes–accurate, but non-germane. Not sure what any of that has to do with the ? at hand. Discussion was what happens when you set PS to 0. Perhaps to reinforce this, a setting of PS 0 and CPAP 0 is essentially a t-piece trial, if we discount any resistance imposed by the circuit, which should be minimal on a good modern, ICU vent. This is why t-piece trials have always seemed ridiculous. Why wouldn’t you want the back-up ventilation and the ability to monitor minute ventilation. I believe it is a remnant of a time when the circuit resistance was abhorrent–the valves on the old Birds were miserable to breathe through. Just trying to make sure we’re on the same page. I guess the crucial question is how the vent behaves specifically with a PS and a PEEP both set to zero. I agree that there is utility to a mode that actually “opens” the circuit and turns it into a virtual T-piece, but that would be a qualitative difference in behavior compared to how PS works in all other situations — in other words, changing the PS from 2 to 1 would mean something very different from changing it from 1 to 0. And it may be. If you’ve looked into this then I believe you. It also wouldn’t surprise me if this behavior differed by model and manufacturer; maybe I’ll ask our rep. I hardly ever have a need to dial down to zero, but it does seem like this could easily be answered by experimenting with a vent and a friendly subject (and perhaps a manometer). Great great episode, Already commented on Twitter but I guess it is better to do it here. – Remifentanil for sedation… I know you dont have it, but here in Argentina we do use it a lot. – Impact of ket on very elderly / fragile folks, is it really so dangerous? – Risk of adrenal supression with etomidate, real impact? – In case I use a push dose pressor, what would be your choice and in which dose? Again, congrats on a great work! etomidate’s adrenal suppression has not shown pt important outcomes, but i see very little use for this drug. I think you will be very happy with the KeyLIME podcast from the ICE folks. Anyone using IV scopolamine as a sedative for these types of intubations? I’ve also seen some of my mentors trial their push dose pressers before intubating. On patients who are on the borderline and not on pressors yet we’ll give a 100mcg of phenylephrine — if it works ,great, if not, we’ll prepare another press or infusion and have it running before the intubation. An interesting post about a very common but least discussed issue. My query is how do u use ketamine even in the low dose that u describe in a patient whose heart rate is already around 150 beats / min. I have precipitated arrhythmias in a few patients. I use fentanyl alone along with topical lido. I’d not intubate the crashing PE ( Even the presumptive crashing PE), with RV dilation on bedside scan – I’d push tenecteplase, yes the next 2-3 minutes are a little tense – especially convincing , junior’s to wait, but generally their saturations and BP improve after that.. Likewise with a tamponade, they don’t need an airway, they need the tamponade drained, and if too unstable to go to the lab then that’s done in the resus room. Thanks for the podcast Scott, intriguing topic. Lignocaine topicalisation of the airway is very effective for removing the gag/cough reflex to an ETT in-situ. We do it all the time for awake fibre-optic intubation. But I don’t believe having insensate mucous membranes around the larynx/pharynx will ablate the sympathetic response to laryngoscopy. The difference being that laryngoscopy causes subluxation of the mandible and significant pressure on the hyo-epiglottic ligament. Just like the mandibular movement from an aggressive jaw thrust is stimulating enough to wake up a sedated patient, even though there is nothing in their pharynx/larynx. It may be possible with the two person technique, as you previously described in the “triple setup”. But maybe avoid advancing the tip of the videolayngoscope as far as the vallecula, but just raise the back of the tongue enough to get a view of the epiglottis and allow passage of your flexible bronchoscope. Thus avoiding the stimulation of a proper laryngscopy. Daniel–I’m not sure I understand your intent. This is a post on hypotensive/shocked patients,why would you want to avoid sympathetic stimulation? You’ve mentioned dexmedetomidine in previous airway lectures. Would you consider that to provide patient comfort once the tube is in, +/- additional topicalization down the bronch? I wonder if this would avoid any potential hypotension issues associated with opiates, although I think highly of Dutton’s fentanyl-based approach.